When U2 opened its Experience + Innocence tour this May, effectively resuming an exploration of the themes it put on pause at the end of 2015, there were new songs, several production enhancements and a thought audiences might not have considered, or at least not heard expressed in a certain way. The thought sounded proverbial -- “wisdom is the recovery of innocence at the far end of experience” -- and was said by the mysterious Stranger in the concert intermission video “Innocence and Experience: The Heroes’ Journey.” As U2 refined the show’s narrative, Bono apparently found the Stranger’s words helpful as a framing device such that he wanted audiences to hear them twice in later shows, but now first from his own mouth as an introduction to “The Ocean” and an "Innocence Suite” of songs. But in Bono’s recent interview with Greene, there was some new, unacknowledged pinching going on. 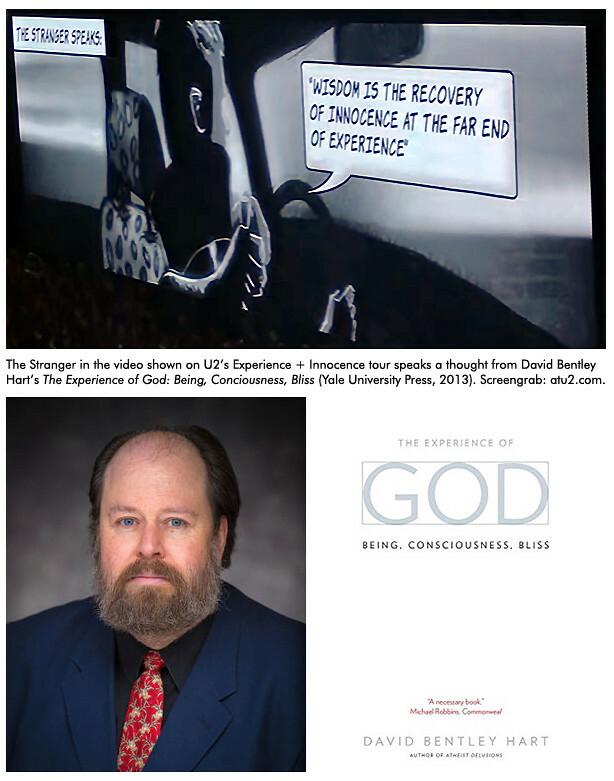 It might have been theft-by-inspiration, with unattributed admiration -- as poets are wont to do -- but what sounds like a new Bonosim is actually a Hart-ism: a David Bentley Hart-ism, written for his book The Experience Of God: Being, Consciousness, Bliss (Yale University Press, 2013). Hart is a prominent American philosopher, scholar of religion and cultural critic, currently working in residence at Notre Dame University’s Institute for Advanced Studies. Outside the academy, his better-known scholarly books are The Beauty Of The Infinite (Eerdmans, 2004), Atheist Delusions (Yale University Press, 2009), The Experience Of God, and his translation of the New Testament (Yale University Press, 2018). He is also a writer of fiction and a humorist, and among his creative works is the collection of short stories The Devil And Pierre Gernet (Eerdmans, 2012). He told me he knows of U2 and its social conscience and thinks the song “Wake Up, Dead Man” is “a brilliantly moving portrait of a very recognizable kind of spiritual anguish.” He likes The Joshua Tree and Achtung Baby, but said he is otherwise unfamiliar with U2’s larger body of work. More to the point, Hart did not know a sentence from his book had made its way into U2’s concerts this year. Pinching, borrowing, alluding or stealing: Call it what you will, but there is a lot of it going on in U2’s intermission video. Featuring U2’s song “Hold Me, Thrill Me, Kiss Me, Kill Me,” it’s a dramatization of Joseph Campbell’s concept of the process one takes to becoming heroically enlightened and enabled, as applied to the band itself. Campbell isn’t attributed in the video, nor are Blake, the Rolling Stones, C. S. Lewis, Christopher Marlowe, Flannery O’Connor or the Roman jailer mentioned in verse 16:30 of the Book of Acts. So in this respect, Hart’s in good company. “If they’re on a Blake kick,” Hart replied, “I’ll have to look into their more recent albums. I am a Blakean of long standing.” Hart did his U2 homework and we then had a conversation through email, from which I composed the following interview. What was your reaction when you learned U2 was using a quote from your book on its tour? I didn't know until you informed me. I had no special reaction at first, other than mild surprise. Since then, however, I have been listening to U2's two most recent albums -- both of which are quite haunting -- and it makes perfect sense to me now. How so? What connection do you see between Blake, U2 and your thinking about wisdom, innocence and experience? Let's say my acquaintance with Blake is one of longer standing and that I know him better. If I have something of a handle on U2's innocence and experience albums, I think they have done well in their use of Blake. He's definitely one of those very British literary figures who believed that there's a kind of divine or angelic immediacy of the soul to God in innocence, but that the soul must pass through the probations and trials of experience to convert that immediacy into reflective awareness and spiritual life. You find similar intuitions in earlier figures, like Thomas Traherne and Henry Vaughan, or in Blake's younger contemporaries Wordsworth and Coleridge, or afterwards in a host of figures, like George MacDonald or even Lewis Carroll. Are you happy then, with how U2 is bringing both Blake and your work into the artistic space it has created on its tour? I wonder if you think your statement is represented well as U2 uses it? For me, the proximity to Blake is a pleasing one, specifically because Blake -- quite apart from his achievements as an artist -- was a visionary who definitely believed that the ground of all experience of the world is a deeper, more original experience of God in all things. He believed that imagination was the vehicle of the knowledge of truth because it already possesses an intimate awareness of the divine mystery. I don't think authors have a right to say how their words should be interpreted by others, any more than songwriters and performers can determine how their listeners respond to their songs. But it seems to me that my sentence does in fact fit the large overarching themes of U2’s recent work quite well. That may be, of course, because I hear the songs through my own expectations of how innocence and experience are related to one another. But, still, it all seems to make sense. “Wisdom is the recovery of innocence at the far end of experience” sounds like a conclusion informed by a great tradition of thinkers. Do you recall how it came to you in this way? Well, for me it is simply one sentence within a continuous argument, so it has no particular provenance. But it does, as you suggest, sum up a great deal in the religious traditions I discuss in that book and in the thinkers that the book addresses. I should explain that one of the governing themes of The Experience Of God is that the very structure of all experience -- whether innocent or not -- is founded upon an original experience of the supernatural, and that in fact we possess a tacit knowledge of supernature before we know anything of “nature.” Innocence is not simply ignorance, but is a kind of immediate experience of the mystery of existence, of the wonderful strangeness of being. But that original knowledge, which we possess with such immediacy in the state of childhood innocence, can become an object of reflection only as we acquire words and concepts, and as the original experience of the question of everything is crystallized into finite experiences and small local questions about this or that. This often involves, of course, a great deal of pain and disenchantment, as well as discovery. And this very process, necessary as it is, makes the original moment of awakening more remote from consciousness, ever more difficult to recall. I think, then, that one way of characterizing wisdom is as that state that we can achieve -- if we achieve it -- only when we reach a point at which words and concepts and the long ordeal of adult experience have all discharged their part, and can begin to fall away, and we are able to return to that original sense of wonder or surprise at being, but now with an ability to reflect upon the mystery and to express it, and to be at peace both with what we understand about it and with what we know we will never understand. Who do you think the mysterious Stranger is meant to be in U2's video, given the context of the story? There, I think, you'll have to ask the band, as I have no idea what the creators of that video intended. It's in the nature of the mysterious strangers that meet us on the way, however, that they are often ambiguous and sometimes seem more dangerous than benign, even when they have something vital to teach us. Since the path to wisdom leads through the ambiguities of experience, friends and strangers are often indistinguishable from one another, or unrecognizable as one or the other. So I can't presume to know what the figure of the stranger in the video precisely represents. Yes, but as U2’s Stranger introduces himself by saying “pleased to meet you, hope you guess my name” and offers the band a card saying "Wormwood & MacPhisto, Inc., Bespoke Atonement Services," doesn't this cast a sinister spin on who this stranger is? The stranger met along the way may indeed be sinister or even diabolical in some sense, and yet still play an essentially beneficent role in one’s journey. Naciketas learned the secrets of God from Yama, the god of death, for instance. Maybe the devil, in tempting Christ in the wilderness, performed a necessary and splendid service. And Christ was the dangerous and destructive stranger who threatened the order of his times in the eyes of those who killed him. There is, of course, a certain sort of Lutheran piety that thinks of the devil himself as “God’s left hand.” But that is not quite my point either. I would simply say that, if I understand what the theme of the tour is -- or the theme of U2’s two last albums -- then the only path from the innocence of inexperience to the innocence of wisdom is one that passes through experience, which in this world involves negation, confrontation with the soul’s own shadow, the awareness of death, the knowledge of good and evil and so on. That, at least, suggests one reason why my words may have been placed in the mouth of that figure. In The Experience Of God, the sentence Bono borrowed is from the Introduction, and it appears only once more near the end of the book. For U2 fans who have not read your book or don’t make it past the Introduction, what could you tell them here to help them understand the book’s larger discussion about what wisdom is and what it means to experience God? Hard to say. I suppose I should note that the book is a work of philosophy and religious scholarship both. It is definitely, as the title says, about the experience of God -- or, rather, God as the source and end of all experience of reality. It draws on the traditions of all the major creeds -- Christianity, Judaism, Islam, Vedanta, Bakhti, Sikhism, and so forth -- in part simply because I also have a background in Asian religions and languages, alongside my training in Christian thought. I suppose it was inspired originally by debates with certain fashionable atheist writings of the past two decades, though that turns out to be a minor concern. Most of those the book dismisses as intellectually crude. The book also ties in to work yet to appear. My current large academic project is a philosophical treatise on the nature of consciousness, one that (again) ends with the experience of God. I mention this only because I don't want the book to be taken as my final word on any issue. I suppose the simplest point worth making is that it is a book that takes seriously the traditional metaphysical claims of the great religions, but attempts to show that those claims themselves flow from the very structure and substance of our quotidian experience of reality. It really is all about the nature of innocence and the nature of experience. There’s no mention of you or your book in U2’s show or the tour program. I’m pretty sure a lot of U2 fans don’t know of you and think Bono came up with that saying about what wisdom is. I suppose my ego -- if I consult its feelings -- might get a bit anxious over the absence of attribution. I mean, I can vaguely fantasize picking up a book of quotations a decade or two from now and finding that phrase attributed to Bono. But I am genuinely pleased that it is a sentence in which he or the other members of the band find something to think about, or something that puts into words something they want to say. And I like their work well enough that I can enjoy the association. Still, a shout-out or two wouldn't go amiss. It would at least make me look really cool to some of my colleagues and students.